At 6:45 am on Friday, March 20, 2009, the Sun is overhead at the equator, marking the vernal (spring) equinox. Here at the Museum, we’ll mark the occasion with Sun-Earth Day, one of the Fun Hundred events marking our 100th anniversary. As part of these festivities, I will be on the Cockrell Sundial from 1 to 1:45pm, showing everyone the Sun and how to use our sundial. Whether or not you’re able to join me on Friday, the following guide to the sundial will help you get more out of this large scientific exhibit which is free to the public. The main features of any sundial, including ours, are the hour lines. These are dark lines marked with roman numerals indicating the hour. The object which casts the shadows you use to read the time on a sundial is the gnomon. 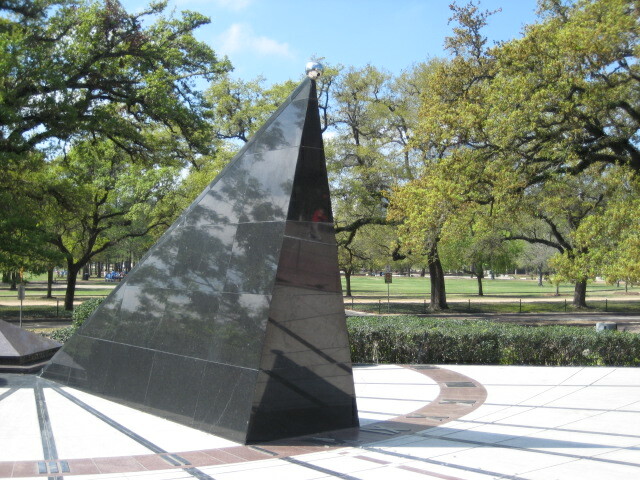 Our gnomon is especially designed for our location; the angle it makes with the base of the sundial is 29.72o, the precise latitude of the Houston Museum of Natural Science. When the Sun shines on the gnomon, the location of its shadow on the sundial indicates the time of day. We don’t mark fractions of the hour (as most sundials don’t), so if you’re not observing on the hour, you’ll need to interpolate a bit and estimate the time. Further, our sundial can’t ‘spring forward’, so the time you read will be about an hour behind until Daylight Saving Time ends in November. Along with the hour lines, we have added some features which serve to make our sundial more accurate then most and to teach visitors a little more about how we tell time. You might notice, for example, that there is a brown line that points at due north, and that the noon line is offset from this. That’s because the time on your watch, iPod, or cell phone is local time not in Houston, but in New Orleans. Earth completes one rotation (does a ‘360’) in 24 hours. Therefore, Earth rotates by 360/24 = 15 degrees in one hour. When people around the world decided to create standard time zones, these zones were defined based on longitudes 15 degrees apart. Time zones in the United States are based on 75oW (Eastern Time), 90oW (Central Time), 105oW (Mountain Time), 120oW (Pacific Time), 135oW (Alaska Time), and 150oW (Hawai’i Time). As a result, when your timepiece reads Central Time, it reads the time at 90oW, the longitude of New Orleans, Memphis, and East St. Louis, IL. In any of these places, the noon line on a sundial would be exactly aligned with due north. Houston, however, is at just over 95oW. We have offset the noon line from true north to compsensate for this. Along the noon line, you’ll also notice small, shiny circles in the shape of an elongated figure 8. This is the analemma. Earth’s orbit around the Sun is an ellipse, not really a circle. Instead of remaining at a constant distance from the Sun, Earth has a perihelion (in January) when it is slightly closer to the Sun, and an aphelion (in July), when it is slightly father away. The difference is small, but enough to make Earth speed up near perihelion and slow down near aphelion. This in turn causes the Sun to be a little ahead or lag a bit behind mean solar noon. The difference between mean solar noon and the actual solar noon on a given date is the equation of time. If you plotted the Sun’s position in the sky at precisely the same time of day throughout a year, you would create an elongated figure 8: this is the analemma. This is the figure we have reproduced on the sundial. At noon (or 1pm in Daylight Saving Time), the gnomon’s shadow will fall not on the noon line, but on the analemma. Note the difference between the analemma point and the noon line on the date of your visit; you’ll need to mentally adjust the shadow’s position by that much to make it agree with your timepiece. The months of the year are also indicated along the noon line. December is indicated farthest from the gnomon, then January/November, February/October, March/September, April/August, May/July, and June. The month names are written in a way to help you use the analemma. In each pair, the month on ‘top’ (farther from the gnomon) is a month when the Sun is slightly behind mean solar noon and the shadow falls on the analemma to the left of the noon line (as you face north). During the months on the ‘bottom’ of each pair (closer to the gnomon), the Sun is slightly ahead of mean solar noon, and the noon shadow lands on the analemma to the right of the noon line. Silver curves associated with each month or pair of months show the path of the gnomon’s shadow on about the 21st of each month. At a glance, you can see how much longer the shadow is in December, when the Sun is low, than in June, when the Sun is almost overhead. On top of the gnomon is a silver ball with three pairs of holes. These holes are aligned such that the Sun shines through a pair of holes near the equinoxes and solstices (in 2009: March 20, June 21, September 22, and December 21). To allow for cloudy weather, the holes are big enough for the Sun to shine through them for several days on either side of the equinox or solstice date. (The holes aligned with the winter solstice are especially large, such that the Sun shines through them for over a month before and after December 21). In each set of holes are lenses which focus sunlight, so you can project a real image of the Sun on a sheet of paper. This works only when the Sun is close to due south–the 1:00 hour during Daylight Saving Time. 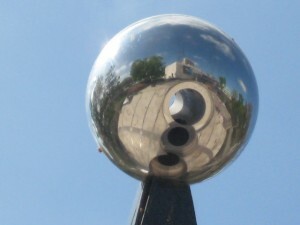 If you see a bright circle of light inside the rounded top end of the shadow–the shadow of the silver ball on top of the gnomon–it’s close enough to the equinox (or solstice) to project the Sun. Place a sheet of paper in the light path, lift or lower the paper to focus, and voila! A live image of the Sun is in your hands. If any sunspots are present, they’ll show up in your image. As I write this, there are no sunspots on the Sun, which astronomers find somewhat baffling. Here is where you can see how many sunspots there are on the day you come. Of the four solstice and equinox dates, June and September are usually oppressively hot and December is often cloudy. That leaves the spring equinox, March 20, which has comfortable temperatures and a reasonable chance of clear skies. That’s why we have chosen this date for our Sun-Earth Day. If you like our sundial, you can take one home with you! Well, this offer is only for Friday’s Sun-Earth Day event, and the one you make won’t have all the bells and whistles on ours. You’ll still go home with you very own hand made timepiece. Other activities include solar cooking and etching your initials into a popsicle stick with a Fresnel lens (yes, that’s why you don’t want to look directly at the Sun). Come on out and join us on Friday! What a wonderful explaination ~ we always enjoy visiting the sundial at HMNS. Thank for the great article!